The most common need for a hip replacement is osteoarthritis. Hip joint osteoarthritis is a degenerative disease resulting in wearing away of the lubricating cartilage of the hip joint. This causes the bones of this hip joint to rub together, which produces painful symptoms in the groin, decreased motion of the hip, and pain with walking and activity. Symptoms of arthritis tend to worsen as the degeneration progresses. A total hip replacement is a treatment option for patients with end stage osteoarthritis of the hip joint, and pain affecting their activities of daily living and quality of life. Typically, a hip replacement is indicated after exhausting conservative treatment options that can include steroid injections, anti-inflammatory medication, activity modification, lifestyle changes and/or weight loss. A total hip replacement is a surgical procedure in which the hip joint is replaced by an artificial implant.This consists of replacing both the ball and socket of the natural hip. A total hip replacement helps to relieve pain, increase hip motion, and improve function. There have been tremendous advancements in the total hip replacement procedure over the years. Dr. Durkin is on a short list of surgeons qualified to perform the direct anterior approach to total hip replacement. There are several benefits to the anterior approach to surgery. The procedure is considered minimally invasive, and is accomplished through an incision approximately 9cm long. Fewer, if any, muscles and tendons are cut, so there is less pain and more joint mobility after surgery. For this reason, there are also here are no hip restrictions postoperatively. There is decreased risk for hip dislocation, and decreased risk for unmatched leg lengths. 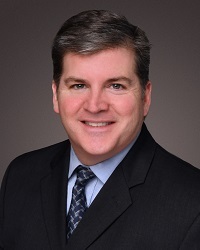 Dr. Durkin also uses robotic technology for additional accuracy and surgical precision. He is one of the first physicians in Illinois who is qualified and trained to perform a MAKO total hip replacement with use the RIO Robotic Arm Interactive Orthopedic System. While most hip replacements are elective procedures, sometimes it is performed on an emergency basis in patients who have sustained a trauma, or certain types of fractures, to the already arthritic hip.